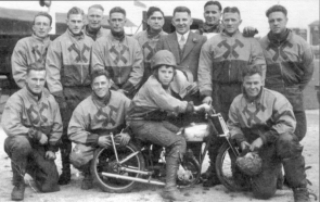 Where did Speedway (motor cycle racing) start in the world? Return Home or to Personalities. Let me (the webmaster) start by saying I am far from an expert on this subject, and the last thing I want to do is start a major controversy. With Ian Hoskin’s an honorary member of our club, I am conscious of causing offence, and do not wish to do so. To refresh the readers memory, I myself have been guilty of quoting the “fact,” that Johnnie Hoskin’s invented speedway at West Maitland. For that I apologize. NSW on 23rd Feb 1923. My idea for writing an article about the subject started with the following correspondence that came in via our web site. Correspondence with John Williams in Brisbane, Australia. I have abbreviated the letters to the basic discussion. 16/01/06 John Williams-- “Here's some more anguish for the purists. (See photo left of early 1915 “midgets” in USA) This is dated 1914-18, no other info on hand but almost positive they are in USA and were taken on a dirt track”. “I don't do any particular research, although at present I seem to have got stuck on Skirrow midgets and Jean Reville (UK), if I see something that I think is incorrect, I'll try and look into it. There's plenty of myth in speedway, for instance Johnny Hoskins "inventing " speedway etc!!. 17/01/06 (Max-editor) So who did start speedway? Johnnie Hoskins lived 12 miles from my home and his son Ian now lives in the same area and is an honorary member of our club. I have read that South Africa claim they started, (bike speedway that is), but what is your opinion? Difficult question Max, everyone wants to work within different definitions of speedway plus the word "invented" was tagged on to Johnny Hoskins. Really we should talk about speedway evolving so that credit is given to all who by decision or chance added to what we have now. I try not to make decisions in grey areas as it has to be proved as documented fact. The meeting at Pietermaritzburg, South Africa in 1907 always pops up as the first meeting on a loose dirt surface. I’ve never seen any actual proof but it was recorded. Other reports tell of racing even earlier in 1897 at Richmond, UK, possibly with motorised tricycles, and racing more akin to dirt track racing occurred in USA in 1902 with meetings not recorded, being run possibly even earlier. In Oz there is photographic proof of racing at Sydney Sports ground in 1909 or maybe even earlier. This puts Maitland far down the track, but in the big picture what Johnny Hoskins did was help promote speedway around the world. I hope that gives you some idea how complex the question is. There are other incorrect stories but no one seems to query them except me!! Webmaster Max. So the real problem with determining where the first “speedway” meeting was held is that first you need to define what “speedway” is. Generally you could suppose that early speedways were a dirt track with a loose surface, of various shapes but generally oval, and the vehicles traveled mostly anti clockwise. 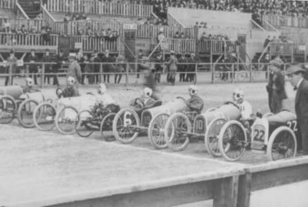 It has been generally accepted that the term speedway first applied to motor cycle racing, but that also could be argued, as there seems to be evidence of car racing in USA at the start of the 1900’s and the term speedway was used. The start of British Dirt Track Racing From Vintage Speedway Forum, September second, 2005. The High Beech meeting (February 1928) is generally accepted to be the first speedway meeting in Great Britain, although there are two other candidates for the honour. The first was at Camberley in Surrey on 7 May 1927, but this is usually discounted, because the riders raced clockwise and the track surface was sand. The other was at Moorside Stadium on Dodd’s Farm in Droylsden, on 25 June 1927. This meeting was organized by Harrison Gill of the South Manchester Motor Club on a narrow 440 yard circuit. There seems to be less reason to rule this one out, but the reason High Beech is generally taken to be the first is because it was after that meeting that interest in the sport really took off, with tracks mushrooming all over the country. From another contributor to the forum. By all accounts the Droylsden meeting should be recognised as the first in England, according to Rob Bamford's 'Homes of British Speedway.' This meeting was run on a banked cinder circuit with racing being in an anti-clockwise direction. The High Beech meeting did attract major attention probably because of it's close proximity to London and the alleged 30,000 people that invaded the forest (3-4000 were expected) the meeting even made the front page of the 'Daily Mirror' newspaper. Most impressive was the ACU's insistence that the crowd should be held behind a rope on the inside of the track. See photo at right showing spectators inside and outside at High Beech. Now we switch to the book “A history of Australian Speedway” by Jim Shepherd. In this book (which is now in our library), Jim puts forward evidence by photo’s of motor cycle meetings on dirt tracks in Australia as early as 1901. He shows evidence of racing motor cycles on a board track near Melbourne in 1909, although that could well have been motor cycles used for “pacing” push cycles and the riders had taken time off for a race among themselves. Ian was asked to read this page and given the right of reply. Here is his answer. Further to your excellent article on the alleged origins of speedway racing, I thank you for allowing me the right of reply. I agree that various new 'historians' of the sport have felt it would gain them credit if they could debunk the story that speedway, as we know it today, truly began under my father's banner at West Maitland, NSW, Australia on Sunday, December 15th 1923. I agree that there were previous isolated motor cycle events that occurred earlier than this in Australia and even America. At least the historians have to be congratulated on their research into newspaper files. But, we may as well go back as far as the Circus Maximus in ancient Rome, where chariot racing was staged before factions of thousands of devoted supporters, who cheered their favorites on to victory in races that were likewise held in an anti-clockwise direction and had chariots broadsiding on the corners. Unfortunately for these scribes, none of the events they have dug out from the files, led anywhere. Whereas, Johnnie Hoskins was the first promoter to put up a cash reward for the winner at West Maitland, and from the huge turn-out this novel event generated, speedway began to form in Maitland with a cinder track, rules and regulations, and the broadsiding of bikes in the corners. No previous event inspired such a metamorphosis as this. Finally, there was professionalism in speedway, the rider could live from his earnings on the track, and men such as Ron Johnson, Billy Lamont and Vic Huxley, willingly left Australia to try their luck in England in l928. My father left Maitland in 1925 to open Newcastle where he staged regular weekly meetings and made a packet for the promoters. He decided to go into business for himself and in 1926 ran the big Sydney Royale stadium, where, unfortunately, a very wet season almost ruined him. Undaunted, he went to Perth in Western Australia and opened the Claremont stadium there and began to make a packet. In 1928, he left Perth to go to England and be in at the birth of the sport there, and took two of the great Australian riders with him, Ron Johnson and Billy Lamont. Johnnie did not have a venue in the UK, until Arthur Elvin in 1929, asked him to run speedway at Wembley. In 1930, the famous Wembley Lions were born and I was invited to ride a miniature motor bike, wearing red leathers at the age of six, to become the world's first motorised speedway mascot. It was in 1930 that league racing began in speedway. Johnnie Hoskins quit Wembley to re-open West Ham, a promotion that had just gone broke. He at last came into his own as speedway's greatest showman promoter until the war closed the sport in 1939. Can any other promoter lay down such a valid claim for being the sport's true pioneer? I doubt it, and so do the hundreds of riders and rival promoters of the pre-war and immediate post war era of the sport, when Johnnie remained actively involved as a promoter at Canterbury in Kent, until his death at the age of 95 in 1987. I rest my case. Photo above is from Ian's book "History of the Speedway Hoskins." It shows Ian on mascot bike at West Ham in 1937. From left back are Tommy Croombes, Eric Chitty, Bronco Dixon, Charlie Spinks, Tiger Stevenson (captain) Johnnie Hoskins, Ken Brett, Bluey Wilkinson and Rob Stobbart. Front row are Arthur Atkinson, George Saunders, Ian and Mick Murphy. On right is Ian with Ivan Mauger at the World Long Track Final here in New Plymouth in 2003. Contribution from Ross Garrigan July 2006. Just a few comments on the subject of "The Origins of Speedway" which appears on your site. The carnival at the Maitland Showground at which motorcycles first appeared was on Saturday December 15, 1923, not Sunday December 15. Ian's father (Johnnie Hoskins) tendered his resignation from his position of Secretary to the Hunter River Agricultural and Horticultural Association at Maitland on May 14, 1925. At the time of submitting his resignation he informed the Association that he was leaving "to take up a better paid position in Sydney". The position was as manager of the touring department of the Royal Automobile Club of Australia. 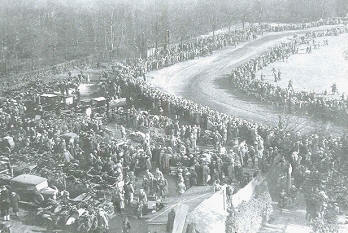 The opening meeting of the Newcastle track was on Saturday November 14, 1925. Johnnie Hoskins did leave his position in Sydney to accept the position of Secretary to the Newcastle speedway. He took up this post on Monday December 14, 1925. The original secretary had been one of the managing company's directors, a Mr. C. A. Jackson. Johnnie Hoskins did not go directly from Maitland to Newcastle, and he did not "open Newcastle". Four meetings had been staged at the new Newcastle track prior to Hoskins commencing work there. Ian Hoskins also mentions that when his father Johnnie sailed to England in 1928 he "took two of the greatest Australian riders with him, Ron Johnson and Billy Lamont". While Ron Johnson was one of the three riders who Johnnie Hoskins did take to England in 1928 on the Oronsay, Billy Lamont wasn't. In fact Lamont, who went to England under contract to A. J. Hunting, wasn't even on the Oronsay. Ian also mentions that his father was in England "at the birth of the sport there". The "birth" of the sport in England is recognised as having taken place at High Beech. Johnnie Hoskins was not present. One other point- Ian mentions League racing commenced in England in 1930. Jimmy Baxter instigated League racing in England in 1929.The motorcycle racing which took place at the Maitland Showground during December of 1923 and the early months of 1924 as part of the carnivals staged at the ground played a pivotal role in the evolution of speedway in Australia. Riders had some continuity of racing at one track, something which had never occurred in Australia previously. In the period from December 15, 1923 to April 26, 1924, motorcycles raced on 15 occasions on the Maitland Showground. Hello Webmaster, I have read the debates on the origins of speedway on your great site the following you may find interesting. I have visited your very interesting website on several occasions and have noted the debate on how it all began, though slightly sad at the seemingly unfortunate tone of Ian Hoskins reply to Ross Garrigan. I offer the following submission to that debate, which I hope you may feel appropriate to publish on your site. I would add that I have no axe to grind with that Great showman and promoter Johnnie Hoskins or his son Ian, just a desire to get as near as possible to the truth. The first known recorded motorcycle race was in 1898 from that day on they have been raced in hundreds of meetings on hundreds of tracks throughout the industrialised world. Concrete cycle velodromes, wooden board tracks, rolled cinder tracks, horse trotting tracks etc all before the First World War. Those with the motivation to search will find these meetings well recorded with photographs. Undoubtedly the emerging industrialising nation of America was the hot bed of dirt track racing. The white hot competition between motorcycle manufacturers in the US led to works teams and professional dirt track riders. Dirt track racing on the 1 kilometre trotting tracks of Germany and Austria was very popular throughout the 1920s. British motorcycle mags reported on these meetings and commented on the technique of skid turning the corners, South Africa also. Who was the first rider to broadside we will never know but one of the candidates must be Don Johns the American son of Welsh immigrant farmers. There are descriptions of him sliding the turns in 1912-14. The idea that a 700yd grass covered trotting track at West Maitland in 1923 was the start Speedway or Dirt Track Racing as it was then known does not in the cold light of day stand up to close scrutiny. However speedway did evolve in Australia with tracks becoming shorter and surfaces deeper with the added spectacle of full on broad siding as opposed to the skidding. “Exciting but not really dangerous sport---An American idea that England might imitate” As an Englishman in America, keenly interested in motor cycling, especially racing, I notice several of your correspondents seem to have mistaken the ideas about racing conditions in the USA. Saucer tracks are a thing of the past; they went out of vogue about 1915. The present day racing is conducted entirely on dirt tracks of half to one mile or sometimes 2 miles to the lap. They are to all intents and purposes unbanked; that is they are, on average only two to three feet higher on the outside than on the inside as they are used extensively for horse trotting races as well as for motorcycles and cars. The surface of a good track is of Clay, which is rolled and dragged, and usually has a cushion of softish earth on top. The tracks are generally surrounded by wooden fences inside and out. During 1922 I do not recollect having heard of one single race meet conducted on anything other than dirt tracks and most of them were half mile tracks. There is also a certain very limited amount of record breaking carried out on banked Board tracks of one mile or more to the lap, in the Los Angeles and San Francisco districts. (Evidence suggests that board track racing continued up to 1928.. NB) I have raced several times at Brooklands and last summer (1922) I raced in seven half mile dirt track meets over here. The dirt track as an engine testing ground cannot compare with Brooklands. By taking big risks a man often beats a faster machine ridden by a more cautious rider. No one would ever win at Brooklands by riding the “turns” two feet from the inside. On a dirt track the going is often best right next to the inside fence and the more daring riders will slither and slide around just close to the fence as they can keep, also no fast machine can be ridden wide open around a half mile track; the machine would turn completely round and go down, though some of the best riders will slide all the way around the turn with the back wheel twelve inches further out than it should be. This sounds impossible but never the less it happens. To all intents and purposes one steers by sliding the back wheel and the peculiar nature of the track surface makes this very much easier than it appears. From a sporting point of view the half mile unbanked dirt track is better than any other form of racing except the T.T.. So long as there is a bank of soft earth between the riders and the fences to prevent some of them taking undue risks cornering, it is the most fascinating sport I have ever gone in for and provided one wears leather clothes one can come off any number of time without serious consequences to rider or machine. The writer would like to see half a dozen dirt tracks scattered over England. They are cheap to construct, the gate money would more than pay for them, and they would give a large number of private owners a chance of motor cycle racing in one of its most fascinating forms. As a contributor to “Homes of British Speedway” may I offer this update on Droyslden. Subsequent editions of HOBs will reflect continuing research. Famer George Dodd had a passion for horses and Harness racing (Trotting), he built a horse training/exercise track, the length was guesstimated at a third of a mile (600 yds) The track was very narrow so for safety reasons the riders started off one at a time although it was said it was possible to catch up and pass on the turns. Neither was there a stadium, this came later. The man behind this meeting was Fred Fearnley of the SMMCC, he is quoted as saying “this meeting was something of an experiment as we know little about this sport”. As an aside:- One of the guests a Fred Fearnleys wedding (1928) was none other than Johnnie Hoskins! Johnnie Hoskins was a great showman and he knew the value of self publicity! Regards, Nigel Bird, West Midlands, England. Return Home or to Personalities. Top. Editor/webmaster---I leave the reader to decide the actual facts of this subject!! !